Sometimes we modellers have a tendency to take the hobby a bit too seriously. We can complain about the accuracy of a new kit, or get bogged down trying to add some tiny detail that probably won't be seen after all our hard work. 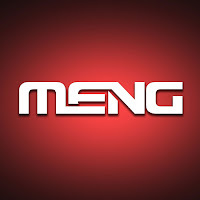 Occasionally, it's a good idea to take a step back, and remember that, first and foremost, modelling should be fun, and that's where these new releases from Meng come in. 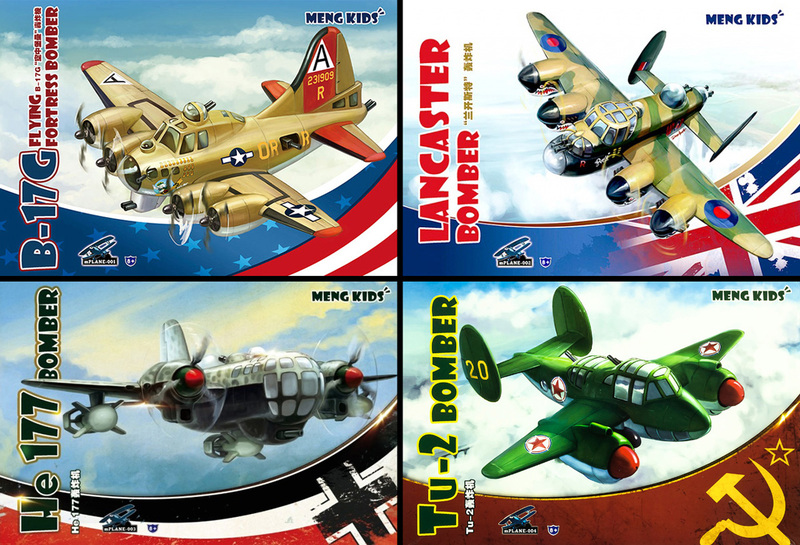 They're branded as 'Meng Kids' and they're essentially cartoon versions of WWII aircraft, similar in concept to Hasegawa's egg plane series. As the name implies, they are a great way to introduce kids to the hobby, but they're also perfect for anyone who wants to just have some fun between bigger projects. These are ultra-simple models, with just a handful of parts, moulded in the appropriate colours, which can be snapped together without glue. You can either build them strait from the box (they can be built up in 10-15 minutes), or you can go to town on them, painting them up like a regular model and adding additional detail. 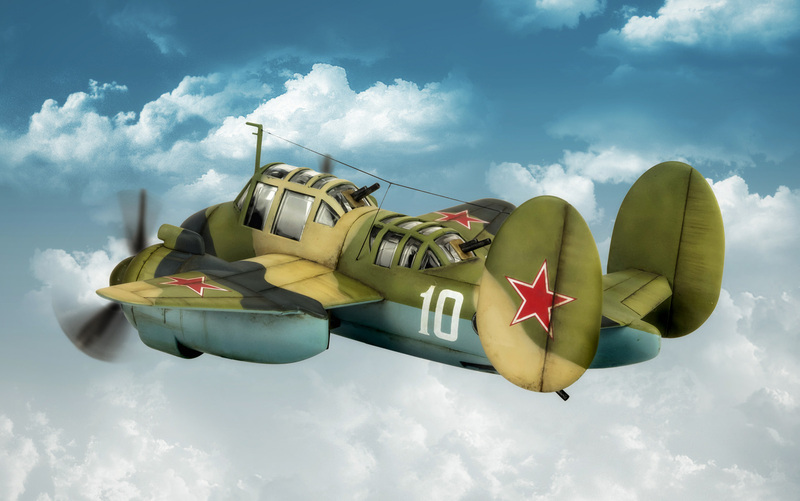 The one we're going to look at here is the Russian Tupolev Tu-2 medium bomber. In the sturdy little box, you get a couple of sprues for the smaller components and glazing, along with single piece mouldings for the upper and lower fuselage, each with their respective wing sections. There's also a separate piece for the twin tails, and the two lower engine nacelles. In addition, you get a small sticker sheet for the markings (no waterslide decals), an instruction booklet and a data card for the aircraft (only written in Chinese, unfortunately). The upper fuselage/wing section will need a couple of sprue tabs clipping off, but is otherwise ready to go. The other individual parts show a few slight scars were they've been removed from a moulding sprue prior to packaging, but they're nothing major, and can be removed with a quick swipe from a sanding stick. Obviously, these aren't designed to be hyper-accurate replicas, so a lot of the smaller details, such as the engine exhausts and the aerial mast, aren't included. As these can be used as toys, it's probably a good idea that these fragile parts are left off. Once the kit's built up it's actually very robust, and easily up to doing a few emergency landings in the garden. The markings come as stickers, which fits the main target audience for these kits, and the stickers are actually pretty good quality, but you can of course replace these with your own decals, as I'll be doing for this build. There's only one option included with the kit, for a North Vietnamese Tu-2, based on the preserved example in the China Aviation Museum in Beijing. Last up, you get a simple 8-page, A5 sized, instruction booklet, and a punched data card with information about the aircraft. The data card is only written in Chinese, but the instruction book has additional English captions. The instructions are very clear, and younger modellers should have no problems following them. Since the parts are snap fix, you won't need any glue, but a little adult supervision may be needed when clipping the smaller parts from the sprue, and cleaning them up. Having said that, I've been known to impale myself with a knife on many occasions while doing this, so a little adult supervision wouldn't go a miss for all of us sometimes. One nice inclusion in the instructions are the little sketches which give snippets of information about the various details on the kit, while you're assembling them. It's great to see manufacturers including this kind of info, so younger modellers (and older ones too) can learn something about the subject as they're build it. There's even more info supplied on the data card, though I've no clue what any of it says. You do get some amusing cartoons of chain smoking pilots, Andrei Tupolev being dragged off to the Gulag and even Uncle Joe himself. 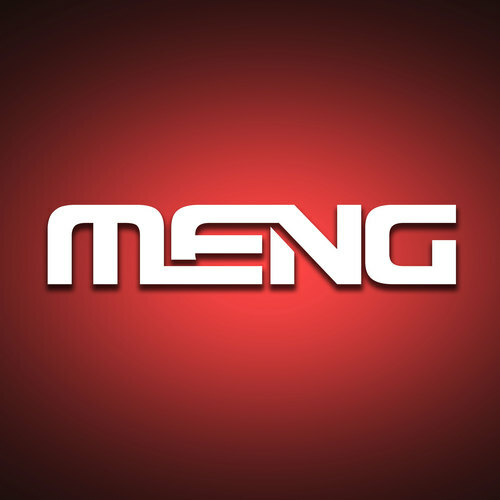 Political correctness (or lack of it) aside, it's great to see additions like this in a kit, and hopefully Meng will provide an English version in future releases. So, let’s get down to construction. There's no internal detail included in the kit so, before clipping the fuselage halves together, I sprayed the cockpit area in black. Not much is seen through the glazing, but the black helps hide the lack of a cockpit. I hadn't intended to add any additional internal details, but in the end I decided to make a very basic pilot's seat from plastic card. This too was painted black, with a bit of paint chipping, then glued to the bulkhead on the lower fuselage. Construction now moved on pretty quickly. The glazing was clipped into place, and the upper and lower fuselage halves joined. The fit on these is very tight and won't be easy to separate later, so make sure you've got all the glazing parts in place first. The tail section then clips in place, followed by the lower engine nacelles which trap the mounts for the propellers. The only external detail I added was the aerial mast. This was made from plastic rod and brass tube. I drilled a hole in the cockpit framing and glued the mast in place. Since the plastic is moulded in colour, you can choose to leave the model unpainted, and simply add the stickers. The plastic colour is a little vivid but not a bad match for the colours of the real aircraft. I decided to paint mine, and the single biggest job of the whole build was masking all that glazing. I started the painting with the pale blue on the lower fuselage, which I mixed from Tamiya acrylics. I added some white to the mix and sprayed some highlights in the centre of the panels. The blue areas were masked off, and the upper green was sprayed with Gunze H303 Green. Again, this was lightened, and a few highlights and streaks sprayed to break up the finish. I decided to go with a three colour camo for this build so, once the green was dry, I masked off the areas that would stay this colour, and first added a pale tan, followed by a dark grey. These were also mixed from Tamiya and Gunze paints, with white added to both colours to spray highlights. Since I was doing a Russian Tu-2, I needed to get some markings. After a quick search through the stash, I pinched some generic stars and bort numbers from an Eduard I-16. After a gloss coat, these were added, and sealed in place with a further application of gloss varnish. The spinners were painted in the fuselage colours, after which the props were painted in aluminium. The props were then painted black, and the paint allowed to become touch dry, before being scrubbed with a damp brush, which left a chipped, worn finish. More chips were added to the spinners. With all the smaller details painted and added, the whole model had a panel line wash, some light weathering, and finally a coat of matt varnish to seal everything in place. The masking covering the glazing was then removed. The last step was to add the aerial using EZ line. Any kind of rigging is far from my favourite thing to do, way too fiddly, but it does add a nice detail to the model. To finish the model off, I decided to make a simple little base for it. This was made from a round MDF blank. The sides were sprayed black and masked off, then the top was sprayed in a mottled green tone. Once that was dry, PVA glue was spread over the top and grass flock sprinkled over it. And that finished the build off. This was a really fun model to put together, and I'll definitely be getting the other kits in the range. It's great to not have to worry about checking references, correcting errors or adding missing details to a kit, and simply have fun throwing it together the way I did as a kid. And, of course, these are a great way of introducing kids to the hobby. If that's something you want to do, or if you just want a quick fun build to get your mojo back after a long project, these kits are a perfect choice.